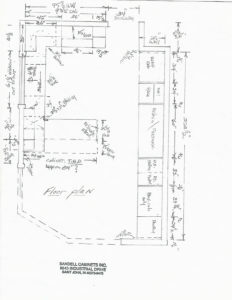 The first thing that Sandell Cabinets needs to know is if the home is built or if it is in the planning stages. If the home is built, we come to the residence and discuss the project with our client. We discuss the existing layout, changes they would like to make, and we take detailed measurements. If the home is under construction or in the planning phase we would work off of house plans or blueprints to discuss the project. If we are constructing Kitchen or Bathroom cabinetry we discuss placement of plumbing fixtures, appliances, or other fixed elements in the room. We would also discuss electrical or drywall needs required for the new cabinetry. We then develop a floor plan with our client that best fits their needs. We discuss the style of cabinetry they like, such as frameless or carcass style cabinetry, framed or traditional construction, or framed construction with doors and drawer faces inset or flush with the frames. We would then discuss wood species, door and drawer front style, cabinet finish stained wood tones or solid conversion finish that looks like paint. After we have selected the basics, we discuss additional selections such as cabinet interior, door hinges, drawer slides, cabinet inserts such as pull out waste containers, pull out trays, space organizers, and dividers etc. 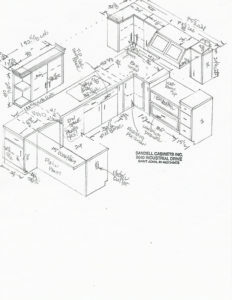 After we have gathered all the information available we create a cabinet drawing with floor plan and elevations. We discuss the drawings with our client and make any necessary adjustments. We are now able to quote prices from the information we have gathered and discussed with our client. *We do not charge for the above service but we do ask our clients to be respectful of our time and the talents required to develop the cabinets of their dreams. Coming Soon – before and after photo gallery! Your beautiful new custom project is only a click away.